All weather forecasts were predicting 4-6′ waves out of Cape Canaveral. Seemed a bit large for my ‘weenie sailor’ comfort zone, so we opted to wait for calmer seas. In the meantime, I had to SEE what these 4-6′ waves looked like…up close…in person. 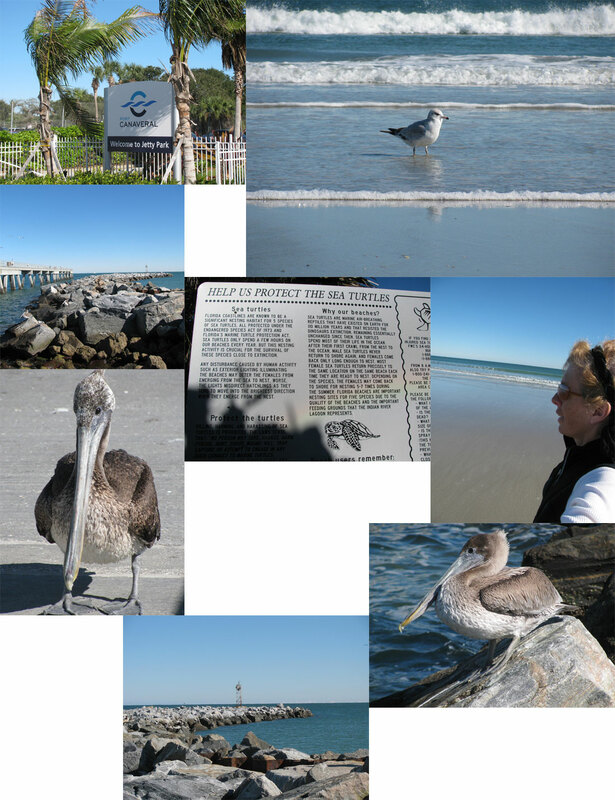 Time for power walk to Jetty Park – located at the inlet to Cape Canaveral. Jetty Park is a delightful campground and beach walker paradise. The walk TO Jetty Park from Cape Marina is filled with Cruise line ports – with huge buildings and enormous parking lots. Not much of a visual, providing all the more inspiration to walk at a fast clip. I imagined huge walls of water breaking over the jetty. Probably even bigger waves than were forecasted. Yeah right. The sea state was perfectly calm. Sure, the breeze was stiff…but hardly a wave rocking the fishing boats – close to shore. I realized that close to shore (for northwest winds) was the place to be. If 4-6′ waves looks like this, then I’m ready to sail!